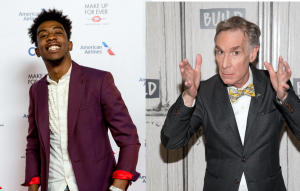 Desiigner has guested on US scientist Bill Nye’s new Netflix show, with the ‘Panda’ rapper learning all about the negative consequences of climate change. The Brooklyn artist made a guest appearance on the season premiere of Bill Nye Saves The World, which debuted on the streaming platform yesterday (April 21). In the sketch, Desiigner is shown in three separate scenarios trying to buy food and drink. However, each time he orders – with his orders including chocolate, sushi and coffee – the product disappears from sight. Nye’s correspondent Karlie Kloss then pops up after each order is denied, telling Desiigner that the item he craves will no longer be available if action is not taken soon on curbing climate change. The ‘Panda’ artist is then told that the animal he popularised is also endangered due to the threat of climate change. A video about Desiinger learning about climate change on Bill Nye the Science Guy. Desiigner’s appearance on the show follows Nye’s recent link-up with Tyler, the Creator, with the latter penning the theme song for Bill Nye Saves The World. Bill Nye Saves The World is set to feature more celebrity guests throughout its debut season. The first trailer for the show, which was shared in February, starred the likes of Steve Aoki, Zach Braff and Rachel Bloom. The post Watch Desiigner learn about the consequences of climate change from Bill Nye appeared first on NME.